I take my whiskey seriously, and whenever I come across an opportunity to share my passion with those who also celebrate the wisdom of what’s been called “the water of life,” I clear my calendar in anticipation of the kind of sipping and storytelling that memories are made of. 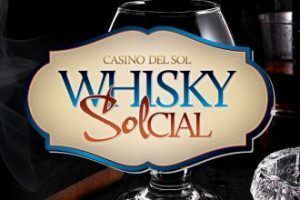 Memories will be in the making this Saturday when a portfolio of exquisite bourbons (and a bonus rye) take flight at Casino Del Sol as part of their last-Saturday-of-the-month series of “Whisky SOLcial” pairings. Casino Del Sol’s executive chef Ryan Clark gave me the initial tip on this flight tasting, and when a three-time Iron Chef of Tucson pairs select bites with whiskeys of this magnitude, you know that it will be done deliciously, intentionally, respectfully, and gracefully, like the very life that Ryan chooses to live out every day. And finally, for cigar enthusiasts like myself, the taste bud trifecta is complete with a thoughtful selection of premium cigars from which to choose that will round out this monumental tasting, at a venue that warmly embraces the spirit of the cigar and those who embody it. On March 30, from 4:00 – 6:00 pm, at Casino Del Sol’s Prema Lounge, you can choose a Regular Flight or Premium Flight, and enjoy corresponding chef-driven bites and a premium cigar that will join these whiskeys in activating parts of your palate that you never knew existed. The menu follows, but secure your tickets now, right here, while they’re still available!